I love leopard print as much as the next girl, but sometimes you have to switch up your call of the wild. This is where python prints come in. Either in a sultry mix of neutrals or rich jewel tones, snake print fashions this season are a welcome addition to my wardrobe. 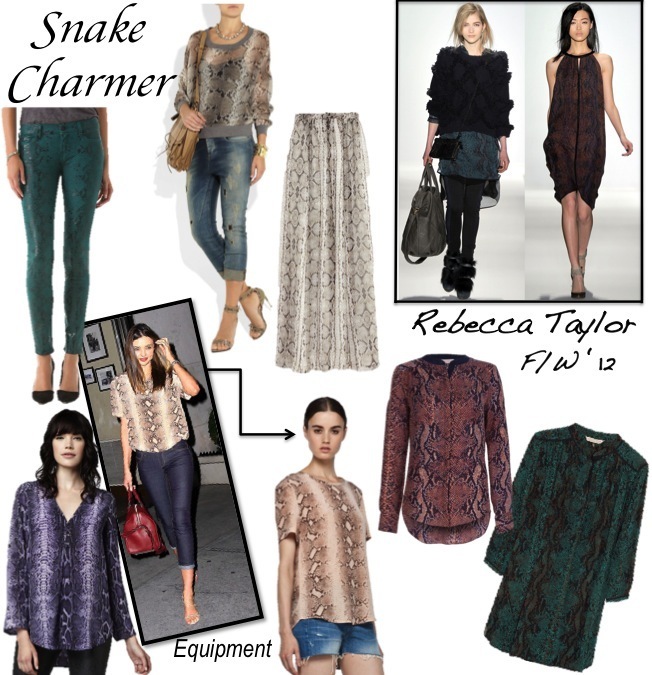 This fall, Rebecca Taylor gives us a number of sophisticated python print silk dresses and blouses to choose from. Personally, I'm lusting over the Equipment Riley Tee (as seen on Miranda Kerr), but I'm too impatient to wait 2 months , so luckily Joie makes a near identical blouse that's already in stores. And of course, then comes J.Crew. Who can resist a snake print maxi skirt?! I love the sheer top but I have so much sheer that I can't justify having more sheer. I think I would love a dress shirt from Rebecca Taylor, that would be a really cool addition. Honestly, a snake print is a little out of my comfort zone, but I don't think I realized until now just how versatile it could be. I love these inspiration pieces! I love snake pattern, but not everyone can pull that off. But if you can, it will be an awesome pieces. And i love that snake pattern from Rebecca TAylor. Snakeskin jeans are high on my fall must have list! I have new snakeprint trousers and I love them! I love it, always a classy choice. I can't get enough Python and Snake thi year!!! Just bought myself (yet another) python clutch! Love the python green print equipment shirt! i have a clutch in this style!